In November 2015, I spent two weeks in Kabul, Afghanistan, working with DAI’s Women in Economy (WIE) project, funded by USAID’s Promote program. One of WIE’s primary objectives is to help young, educated Afghan women find jobs and move up in their careers. My main focus was to explore how WIE could (a) integrate technology tools into its work, and (b) engage with local technology partners. This is one of two blog posts about my time there. This post is also part of a larger set of Digital Insights that DAI’s ICT team collects from various developing countries. 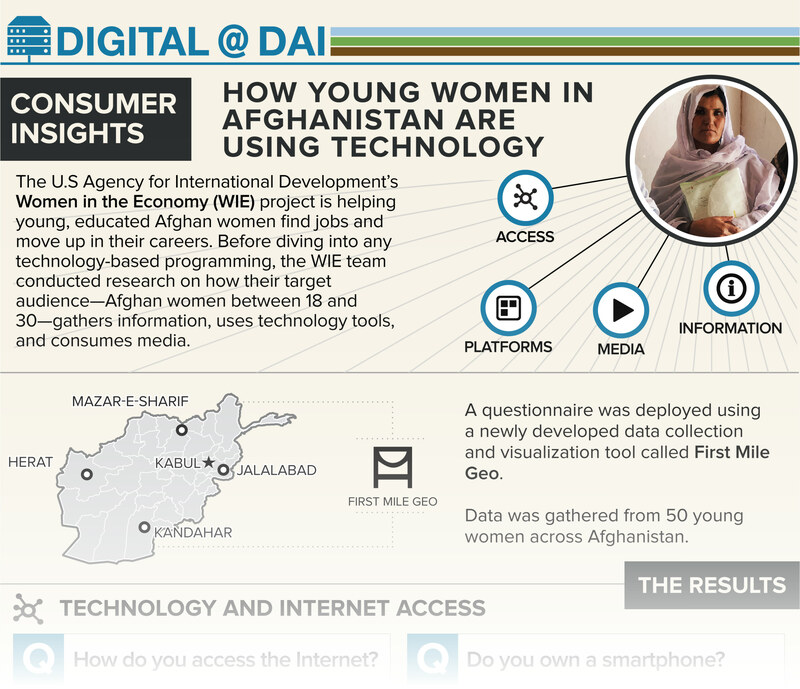 Before diving into any technology-based programming, the WIE team decided to do some research into how their target audience—educated Afghan women between the ages of 18 and 30—gather information, use technology tools, and consume media. To do this, we created a questionnaire and deployed it using a newly developed data collection and visualization tool called First Mile Geo. WIE’s regional managers, based in Kabul, Kandahar, Jalalabad, Mazar-e-Sharif, and Herat, used First Mile’s mobile-based and paper-based collection tools to gather data from 50 young women around the country*. The results were fascinating: WIE’s target audience is highly tech savvy, with 75 percent of them owning smartphones and 90 percent having internet access. They’re active on social media sites such as Facebook and Viber, and many of them (31 percent) use online tools to search for jobs. These insights on technology usage and media consumption, especially as it relates to job searches, will allow WIE to tailor its approach to digital engagement, training tools, and media outreach. Find additional results from the study below. All of the respondents own a mobile phone, and 90 percent of them have access to the internet. However, 60 percent report that other members of the family used these phones quite often—i.e. it’s a shared resource for the family. More than 75 percent of respondents own smartphones, and for a plurality (41 percent), mobile 3G is the only source of internet access. Two-thirds of respondents access the internet at home, and most (40 percent) access the internet between 7 and 10 p.m. Chart 1: Do you own a smartphone? Almost three-quarters of the respondents (73 percent) are active on social networks, and Facebook by far was the most popular social networking platform (used by 73 percent of those active on social networks). Viber is the most common messaging app, preferred by about 47 percent of respondents. Television: Respondents watched television for an average of 1.8 hours a day, and a majority (76 percent) watches television between the hours of 4 and 10 p.m. The main topics of interest on television were entertainment and news shows. Tolo was by far the most popular national television station among respondents (65 percent), followed by Shamshad TV and local TV stations, each of which was listed as a favorite by fewer than 10 percent of respondents. Radio: In contrast to television, respondents only listened to around 40 minutes of radio a day on average, and about 50 percent reported not listening to radio at all. Among those who do listen to radio, they do so across the day between 7 a.m. and 7 p.m, and typically listen to news and entertainment programming. Arman FM (56 percent) and local radio stations (32 percent) capture the majority of radio listeners. Since the WIE project is focused on helping female jobseekers, we also asked respondents about their current employment status. The majority of respondents (73 percent) do not have a job. Most of those with jobs are employed by government and local nongovernmental organizations (70 percent). They use personal connections (37 percent), job websites like Jobs.Af (31 percent), and university career centers (23 percent) to find information on new jobs. Other sources like mobile-phone based services or TV/radio advertising were not important sources of job information. The vast majority of respondents (96 percent) is interested in improving their job-hunting skills via technology and would prefer to receive such training via online video (35 percent), smartphone app (31 percent), or SMS/IVR capabilities (24 percent). However, very few (around 12 percent) have received any form of online training in the past. Therefore, WIE would need to do some amount of capacity training or deeper market research in this area to explore whether technology is a viable method of skills transfer.